After receiving a missing person report from the Big Valley Area, local law enforcement and assisting agencies located the body of an Adin resident. According to a statement from the Lassen County Sheriff’s Office, at about 10 a.m. Thursday, Feb. 14, the department received a report of a missing person in the Big Valley area. The sheriff’s office and Cal Fire dispatched personnel. The missing person was identified as Daran Myers, 70, of Adin. According to the statement, Myers had reportedly been working on a weir/dam to regulate water levels on Willow Creek when he went missing. Cal Fire, the Lassen County Sheriff’s Office and a crew from Intermountain Camp searched the area but were unable to locate Myers. 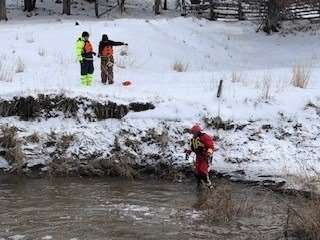 Another search was conducted today, Friday, Feb. 15, by the Lassen County Sheriff’s Office, Cal Fire, Intermountain Camp, Lassen County Sheriff- Search and Rescue and the swift-water rescue team from the Susanville City Fire Department. At about 1 p.m. the recovery team located Myers’ body, according to the statement. The cause of death is being investigated by the Lassen County Sheriff-Coroner. The Lassen County Sheriff’s Office thanks those agencies that participated in the search, including Cal Fire, Intermountain Camp, Lassen County Sheriff- Search and Rescue and the swift-water rescue team from the Susanville City Fire Department. “The operation was successful due to the commitment and professionalism of all of these agencies,” read the statement. The Lassen County Sheriff’s Office would also like to thank the Red Barn and Big Valley Market for supplying food and beverages to the search teams. This incident should serve as a reminder of the dangers associated with flooding, the statement read.